The IAASTD argues that reducing agriculture‘s dependence on fossil fuel energy must become a priority. In addition, enormous potential lies in the optimisation and replacement of plant-based fuels, such as firewood which in Africa is still the most widespread energy source for cooking. Many of these measures would not only reduce CO2 emissions, but would also help agriculture to better adapt to future climate changes and to conserve natural resources and biodiversity. They could also bring economic benefits. Such win-win measures could help trigger a climate-friendly global shift in agriculture. However, the IAASTD stresses that individual measures to cut CO2 emissions must be adapted to the respective local conditions. The report clearly warns that they cannot be exclusively assessed according to climate aspects while disregarding contexts, indirect consequences as well as the impact with respect to other ecological and social targets. According to the IAASTD, “silver bullet” or global solutions in this context do not exist. A secure, global solution does exist however when it comes to increasing food energy efficiency and the question of how many calories of fossil energy input are needed to produce one calorie of food that is actually consumed. As long as 30 to 50% of all foodstuffs in industrialised countries are simply being thrown away in factories, retail, restaurants and private households, and up to 30% of agricultural production in many tropical and low-income countries is lost after harvest before it can be processed, it is here that the largest efficiency gains could be achieved. Public awareness of food losses and waste has increased remarkably over the past years. 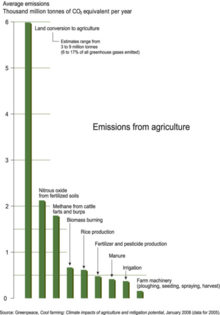 Although agriculture is a key factor in the avoidance of emissions and the possible sequestration of carbon, it tends to be largely neglected in national and international climate protection strategies. The majority of the billions of agricultural subsidies paid by industrialised and emerging countries continue to promote cultivation and production methods, consumer habits and trade flows which all contribute to global warming. Development cooperation in agriculture is also still pursuing obsolete strategies, which focus on increasing yields through higher energy input, particularly through agrochemicals, but also through mechanisation, irrigation and business specialisation, for example by separating crop cultivation and livestock farming instead of integrating both. The IAASTD does not mention climate-smart agriculture, a concept first presented by the FAO in 2010, which has since then been interpreted by many different stakeholders according to their interests. The FAO understands this term as a variety of measures in agriculture and forestry to adapt to climate change, avoid emissions and increase the carbon storage capacity of soils. In contrast, the World Bank and its agricultural research centres promote it mainly as a concept of compensating for carbon sequestration in the framework of the UN Climate Convention. This is heavily criticised by peasants’ organisations and NGOs. They warn against a one-sided focus on carbon sequestration which is open to interpretation, limited in time and neglects the prevention of emissions. In addition, they fear a bureaucratic certification mechanism, which especially a large scale promises highly profitable revenues, thus further encouraging land grabbing. Climate-smart agriculture could also open the door for ecologically harmful practices such as the use of herbicides and the cultivation of feed and energy crops which have been genetically modified to be resistant against these herbicides, thus temporarily reducing the need for ploughing. Soil Association What impact does organic farming have on climate change?